THE Hungry Bon Vivant has had his home taken over by builders and as such was forced to find new temporary digs. I was fortunate enough to take over a mate’s warehouse conversion just around the corner from the White Rabbit Gallery in Sydney’s Chippendale and as such I have been able to spend some time viewing the new exhibition and tasting my way through the tea menu in the gallery’s excellent tea house with the young and up-and-coming tea connoisseur Miss Pla and her sister Miss Gob. As a lover of Taiwanese Oolong I just had to try the intriguing named Jin Xuan (Milk Oolong) from Taiwan ($5). It was completely different from what I was expecting. The description on the menu described it as having a milky taste. Light straw in colour, it had an unusual, almost peachy aftertaste. It was quite pleasant and firm (but not strong) but was not like a traditional oolong which can be quite ‘herby’. Tie Guan Yin (Iron Goddess of Mercy) Oolong ($4.50) is the type of oolong that I have come to love. Long lasting, firm tannin structures, deep and herbal with earthy/mineral traces. Top notch. Another joy was the Mei Gui Oolong (rose oolong) ($5) another Taiwanese oolong with classic oolong flavours but again not as strong as the Iron Goddess of Mercy. It has traces of rose in its perfume and aftertaste but not as to detract from the tea itself. It is brewed in a clear glass tea pot so that you can admire the pretty pink rose buds bobbing about amongst the tea leaves while sipping on it. A nice introduction to Taiwan oolong. The young Miss Gob and Miss Pla were intrigued by the Princess Flower Tea ($5). They watched with awe the unfolding of the tea buds into a blooming gardinia-like flower through the glass teapot. 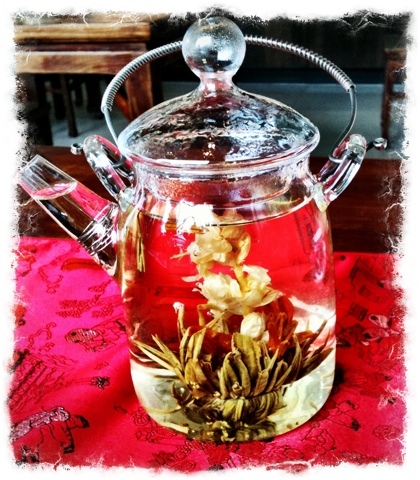 The tea comes as a tightly-wound ‘bulb’ that sinks and then gradually ‘blooms” with white jasmine floating to the top. The white tea leaves are bound together (so as not to separate and create a flower effect), and are wrapped around a red amaranth flower which gives the ‘flower’ a brilliant red centre. It’s a pleasant soft tea that is not too pungent and has a faint wildflower taste. Finally, the Zhu Ye Qing (Bamboo Leaf) Green Tea ($5) – a rare find in any teahouse. Zhu Ye Qing was created in the early 1960s by a monk near the top of the sacred Buddhist mountain, Emei Shan (峨眉山) (which is now an UNESCO Cultural Heritage site in China’s Sichuan province). The tea is so named because the leaf has a similar shape to a bamboo leaf with both ends pointed. The leaf is slender and almost needle like and is actually quite attractive to look at (possibly why it is served in a glass tea pot). The tea itself may not be to everyone’s liking – the brew is light-green/straw in color with very grassy flavours (somewhat vegetative) with green tomato overtones. It is a tea that can hold up after many steepings. The White Rabbit Gallery also has a new and exciting exhibition called A Decade of the Rabbit, which features the work of 30 artists mixing new works with viewer favourites from earlier shows. He An’s illuminated-sign installation, which reflects on multiple meanings of love. I Watch Myself Dying, Bingyi’s arresting record of her torment after being horribly burned. Zhou Jie’s porcelain city, in which the buildings resemble organic growths. A startlingly realistic street doorway, made by Gao Rong with nothing but fabric and thread. The exquisite seascapes of Shi Zhinying. The woven-wire “shadow” of a Jeep chassis, painstakingly (de)constructed by Shi Jindian. If you live in my former town of Adelaide you are in luck as some of the White Rabbit Gallery’s collection of contemporary Chinese art will be shown from 15 July 2011 in the Anne and Gordon Samstag Museum of Art at the University of South Australia. The museum will be hosting a major exhibition of works from the White Rabbit Collection including Shi Jindian’s CJ750 motorbike, Sun Furong’s Nibbling-Up Series and Dong Yuan’s rooms made of paintings. Also, if you are around the White Rabbit Gallery area on a weekday and want a coffee instead of tea go where Chippendale’s architects, artists and designers flock – the Little Queen Cafe. It’s a hole-in-the-wall, below-street-level cafe where you can sit at one of the long tables or benches (or on a milk crate on the street), and have a decent coffee. Try one of their delectable and fluffy home-made muffins (which change daily) for $4.50. 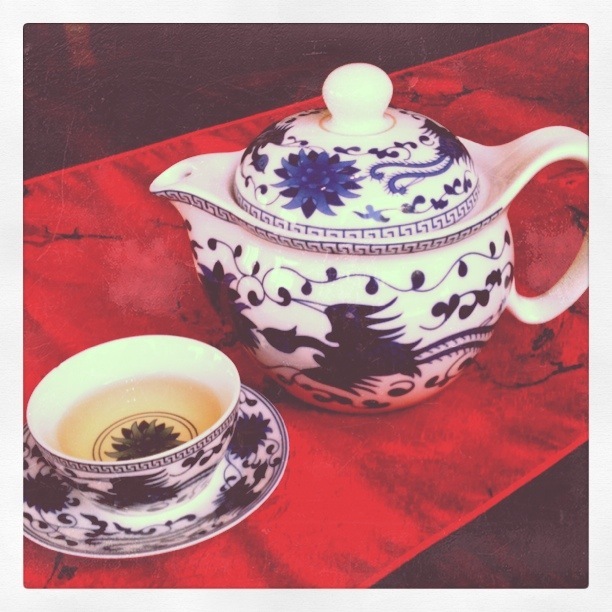 Read The Hungry Bon Vivant’s previous review on the White Rabbit Gallery’s Tea House here. The verdict: Art meets tea culture. An excellent variety of teas to savour among modern and contemporary surroundings in one of Sydney’s hidden gems. 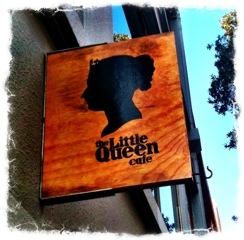 Little Queen Cafe, 28-30 Queen Street, Chippendale, NSW, 2008 Australia. Open only on weekdays from 8am to 3pm. This entry was posted in Adelaide, Chinese, New South Wales, South Australia, Taiwanese and tagged Adelaide, Australia, Chinese, gallery, Sydney, Tea, Teahouse, White Rabbit Gallery. Bookmark the permalink.